Sysco is starting off the year focused on the big issues! 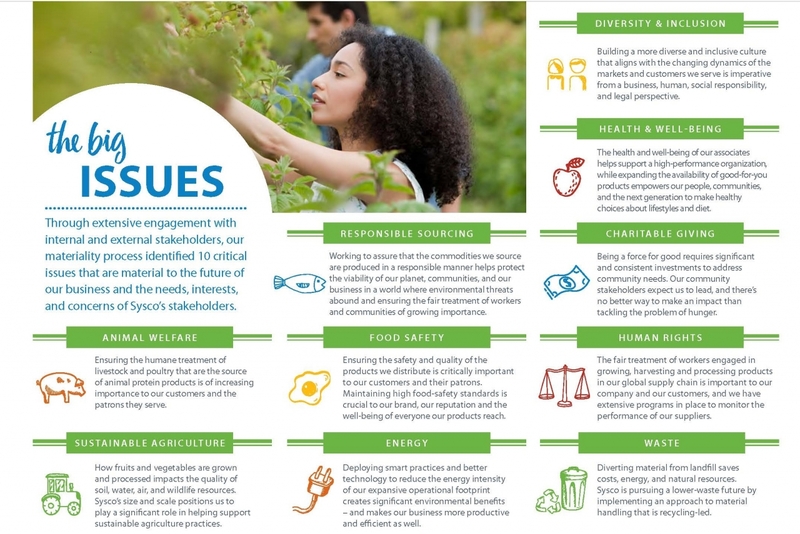 Through extensive engagement with internal and external stakeholders, our materiality process identified 10 critical issues that are material to the future our business and the needs, interests, and concerns of Sysco's stakeholders. Check out the infographic above to see how we're Delivering A Better Tomorrow. Sysco is the global leader in selling, marketing and distributing food products to restaurants, healthcare and educational facilities, lodging establishments and other customers who prepare meals away from home. Its family of products also includes equipment and supplies for the foodservice and hospitality industries. With more than 67,000 associates, the company operates approximately 330 distribution facilities worldwide and serves more than 600,000 customer locations. For fiscal 2018 that ended June 30, 2018, the company generated sales of more than $58 billion. For more information, visit www.sysco.com or connect with Sysco on Facebook at www.facebook.com/SyscoCorporation or Twitter at https://twitter.com/Sysco. For important news and information regarding Sysco, visit the Investor Relations section of the company’s Internet home page at investors.sysco.com, which Sysco plans to use as a primary channel for publishing key information to its investors, some of which may contain material and previously non-public information. Investors should also follow us at www.twitter.com/SyscoStock and download the Sysco IR App, available on the iTunes App Store and the Google Play Market. In addition, investors should continue to review our news releases and filings with the SEC. It is possible that the information we disclose through any of these channels of distribution could be deemed to be material information.